Running short on time? Not sure how to complete your shopping list? Let us help with just a few suggestions from the thousands of items we have available at the shop. Need a tree, ornaments, and everything you need to entertain during the holidays? We’ve got you covered there too! We’ll help even more by providing complimentary gift wrapping! We’ve got everything from fun to fancy in our barware assortment. Gold-trimmed glasses are a great gift for a host or hostess! You’ll find some great choices in our mens clothing area. We have classics like denim jackets and Pendleton wool shirts. Keep your guy warm this Winter! We recently expanded our music selection at the shop! With hundreds of vinyl to choose from and new arrivals each week, it’s easy to find an armload for your music-lover! “We all live in a yellow submarine…” Come in and see our gift assortment inspired by the classic Beatles movie. We have dinner plates, cookie jars, mugs, salt & pepper shakers, and more! Who doesn’t have a favorite Disney movie or character? Come look through hundreds of collectible items including Disneyland ticket books, snowglobes, and ceramic figurines. There’s a reason why jewelry is a big seller during the holidays - Women love it! We have lots of vintage jewelry to choose from - including full parure sets to individual brooches and earrings. You’ll find lots of choices in our womens clothing area. Choose from coats & jackets, blouses, sweaters, and dresses. 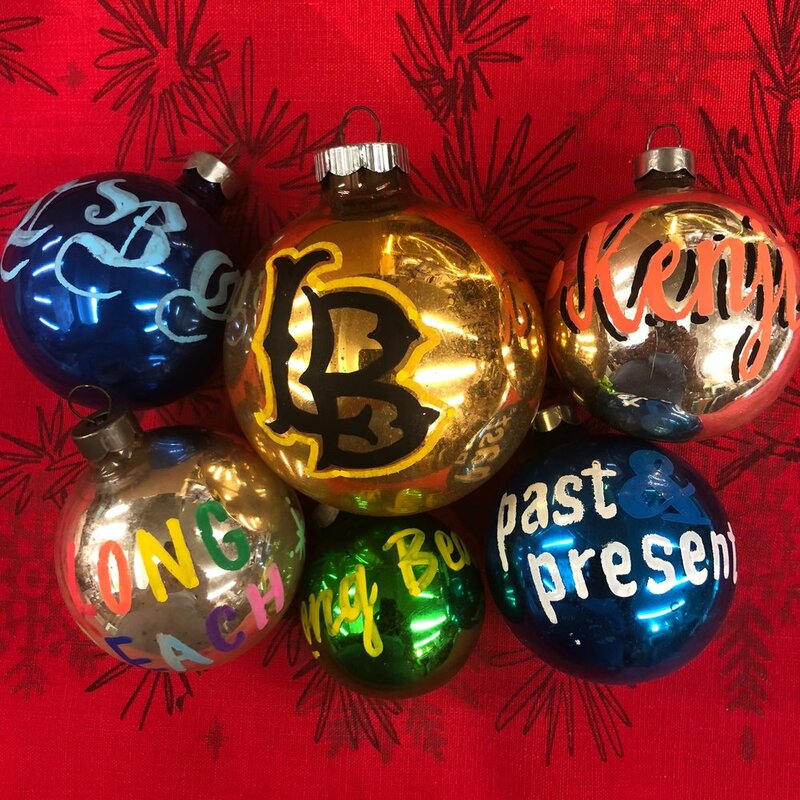 We are currently taking orders for personalized vintage glass ornaments featuring hand-painted details by Regina Nguyen. Commemorate a wedding, new baby, graduation, child’s name, pet’s name, Christmas 2018, or anything else you can think of. For just $5 each, you can afford to give them to everyone on your list! We are featuring product from Ninoska Arte, makers of graphics featuring pop culture references. Our assortment currently includes wall plaques, prints, t-shirts, and pillows. We just received more than 70 license plate frames featuring NFL and MLB teams, with a few NBA and NHL choices as well. A Great gift for any sports fan! From Timex to Casio, and Mickey Mouse to 80’s fashion, you’re sure to find a great gift among our watch assortment. Especially popular right now - LCD chronographs and calculator watches! Show your Long Beach pride with a gift from the LBC! Coffee mugs and cocktail glasses make easy gifts that are sure to be a hit! We are excited to be offering our exclusive Rainbow Tree for the first time! It is six feet tall and the perfect tree to put everyone’s gifts under. Just $99!